The Force Bond IS NOT CLOSED! Re: The Force Bond IS NOT CLOSED! Rey just goes by the motto- if you love someone, let them go, if they come back, they love you, nana. If he still doesn't get the message then she is probably going to hunt this him down herself. @motherofpearl1 Yes, I agree, but if you see how Han treated Leia...instead of discussing his feelings, asking her how she felt, seeking permission to physically kiss her (telling her what she needed)...um, his model for a gentlemen wasn’t the best. That’s why I think in some ways Ben Solo redefines the man...he doesn’t want to fly Solo. He wants to be the knight (which he is) and treat her as a lady. He asks permission and questions. Sometimes, he uses the truth to manipulate those facts to his own ends...but so did Darcy. And Elizabeth (like Rey) didn’t tolerate it. Princes feel entitled. They are dark kings who need some enlightenment (Rey, a drop of gold son LOL) and learn to behave “in a more gentleman like manner..” This accusation angered Darcy and was the catalyst to his maturtation as lover. Darcy was trained to be arrogant like his father before him. He needed Elizabeth to refuse and break him before she made him. @Good-olio Raeh wrote: @motherofpearl1 Yes, I agree, but if you see how Han treated Leia...instead of discussing his feelings, asking her how she felt, seeking permission to physically kiss her (telling her what she needed)...um, his model for a gentlemen wasn’t the best. That’s why I think in some ways Ben Solo redefines the man...he doesn’t want to fly Solo. He wants to be the knight (which he is) and treat her as a lady. He asks permission and questions. Sometimes, he uses the truth to manipulate those facts to his own ends...but so did Darcy. And Elizabeth (like Rey) didn’t tolerate it. Princes feel entitled. They are dark kings who need some enlightenment (Rey, a drop of gold son LOL) and learn to behave “in a more gentleman like manner..” This accusation angered Darcy and was the catalyst to his maturtation as lover. Darcy was trained to be arrogant like his father before him. He needed Elizabeth to refuse and break him before she made him. But...did Darcy have the same hurt in his soul as Kylo? @motherofpearl1 No, but that doesn’t negate the comparison and allusion. There’s the difference; there’s the originality of the story. That this is man that comes from great lineage but what told he wasn’t a prince but a monster...he’s whole life. A word curse from his mother and father became a prophecy of the other chosen one. Man to monster; monster to man. Genes alone do not determine fate; nurture also has a role to play. @motherofpearl1 They did indeed. But no parent is perfect. Especially two already rather selfish people with a very special child. They didn't know how to handle him and as a result, they only pushed him away. Hopefully Rey can being a beacon to pull him back. Hahahaha, she is indeed a great balance to his darkness. She is a balance in the light and through the novelization, we see she has an understanding of the force and more importantly her role within the force that Kylo has yet to embrace. She is a conduit for the force and she knows it now. She is strong powerful and kind with a heart that has known heartbreak. She came from a similar background to Ben. Willfully abandoned by her parents, cast away as trash but instead of letting that make her bitter she allowed it make her strong. Yes she still pined after that type of relationship, still wanted that love, still needed that to ground her...needed the knowledge or rather needed the acceptance from her parents in order to make her feel whole... but in the end, when she realized she was never going to get it... she let it all go and that... THAT is the moment she became more powerful in the force. She stopped trying to control the force to her will but rather allowed it to flow through her. She found her place. Kylo who was also willfully abandoned had another type of upbringing that created the monster within him. You tell someone they are a monster their whole life, they will believe it. You tell them they are unbalanced and weak... they will believe it and it will eat them up. Plus coming from a privileged background and the lineage he does. He is the poster boy for a bad boy that comes from an upper-class family... where the only way he is noticed is by rebelling against everything he is and has. Now he has nothing and no one and the First Order certainly does not respect him, they fear his power... but they do not respect him. He is still a child in many ways. Confirmation from The Last Jedi comic, The Force Bond isn’t closed. Thank yoy very much @ReyloLoverT for sharing. I noticed something in this design. The best thing is that the link is not closed. But their faces and how they talk - make me think that both say it with anger. It's as if he were still saying " I will destroy you". But she answers "that's for sure", as if she hated him now too. The other thing I noticed. Pay attention to us. 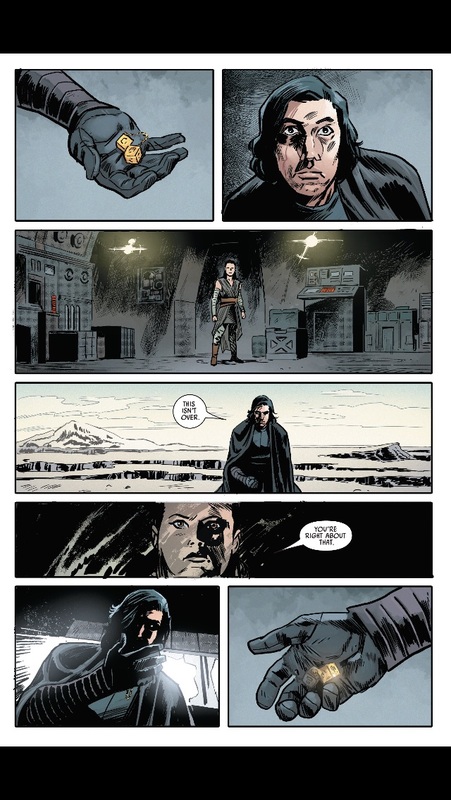 Throughout the comic, Kylo's face is full of shadows. It is in shade even when it don't need. His face is clear only in the elevator with Rey. For Rey the same thing is true. Her face never has shadows. As if the designer avoid to do it. Her face is always in the light. Look at the pictures now. Kylo's face is full of light, while Rey's face darkens. It makes me think that Kylo has some reason (he does not want to destroy her, he really thinks that the bond with her is not closed and I add, he hopes to reach an agreement with her) while Rey really wants to destroy him, believing that he has become evil. Hi! You’re welcome for the Post. I think that this was done on purpose. Remember after TLJ a lot of antis said that the Force Bond is closed. There’s has been a lot of stuff that Disney/LucasFilm has released after to show us that the bond is not closed and that this isn’t the end of the reylo story, more like a chapter end in a book. The way I see the comic is not threatening or like angry. They are telling each other that the bond isn’t closed (because Snoke died) and that they will meet again. Ben is going to have to do this for himself. But she’s patient and will wait for him. Ei, @ReyloLoverT I love when you say “you can take the horse to the water, you can’t force it to drink” . I liked everything you said. I forgotten about the end of TLJ. Thank you very much for this observation. I have recently read the author has said that limiting oneself to seeing the link only from a romantic point of view is a mistake. He added that it is a more intimate bond. Now I add, as if they were two sides of the same person, who vibrate only in one light. Clear for Rey, dark for Kylo. What I wanted to emphasize, is the hypothesis of an opening of the movie IX, with Rey stubbornly fighting Kylo. In the same way, I expect to see a more adult Kylo. I believe that Kylo now has a goal. Until now he has always been the victim of choices made by others. Now he's free and I think, for the first time, he really wants something. According to me, at the end of TLJ, he has realized his stupidity in pursuing anger. His anger only led to destruction what he loves, without ever getting anything. I believe that Kylo, ​​know, time has come to overcome his anger. And he will do it to have her. I know it's a romantic concept, but I think the light in his face at the end of the comic, for me, means this. Forgive me, my bad English, limits the possibility of explaining what I think. Again thank you for your post ! It's funny, but at the end of TLJ I actually disliked Rey...she seemed so sanctimonious in that scene. Yet later when she was watching Finn care for Rose, she seemed very isolated, as if she was envying them their closeness. At the end of the day, there isn't a single person in the galaxy who understands her as Kylo does....and vice versa. Yeah I didn’t like the characteristic of Rey after the Throne Room because there were like two Rey’s: one was happy and wooohoo I like shooting on the Falcon, and grrr I’m angry at Kylo... the other Rey is like I’m pining for him. I think editing is a bit at fault with this. Rey's behaviour on the Falcon was a bit...odd to me. I vividly remember Daisy saying she didn't think Rey would become a Jedi, and she certainly doesn't behave like one. Rey is as full of rage as Kylo. Jedi wouldn't take such fun in killing, for one thing! I think I heard or rather read that Daisy said that Rey isn’t a Jedi and isn’t gonna be a Jedi too. You’re right about that. And she doesn’t act like a Jedi either. Not a Sith. Neither does Kylo/Ben. Crazy as it seems Kylo had the right idea when he suggested moving forward and letting go of the Sith and the Jedi.....he unfortunately went about it in the wrong way! Rey didn't want the FO killing Finn and Leia, but although her reaction was understandable I thought it was awful that the first thing she did was reach for the light sabre. From Kylo's point of view he killed his mentor for her, offered her the galaxy - and she tries to kill him. No wonder he was mad! @motherofpearl1 wrote: Crazy as it seems Kylo had the right idea when he suggested moving forward and letting go of the Sith and the Jedi.....he unfortunately went about it in the wrong way! Rey didn't want the FO killing Finn and Leia, but although her reaction was understandable I thought it was awful that the first thing she did was reach for the light sabre. From Kylo's point of view he killed his mentor for her, offered her the galaxy - and she tries to kill him. Oh totally. Whenever these movies say something rather direct and on the nose, like saving what we love, not destroying what we hate, or see you around kid, or the greatest teacher failure is, it's always prophetic. Even if it doesn't always mean what the speaker thinks it does (I will finish what you started). Rey's issue is the opposite, she was clinging on too much to the idea of black and white, good and evil Sith and Jedi, and that this is what she thought the world should go back to. Which she learns doesn't actually work and never really did. Funny how Luke was actually in a very similar mindset to Kylo, that all of the Sith and Jedi should end and no one shoud really try anymore. But he learns otherwise over the course of the movie, as a sort of role model for Kylo.